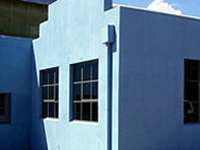 Australian owned and operated, Ability Building Colours, has acquired a reputation for combining leading-edge material technology using their chemical admixtures for cement based materials and very long life wear resistant chemical solvent and odour free paints and coatings all developed with a philosophy that pays due respect for the aesthetic value of colour in the design of materials, products and structures. After many years of catering to the professional needs of Building Contractors, Landscaping contractors, Trades Persons and other creative artisans in the building industries for the supply of materials, Ability’s staff have developed a refined understanding of products that are most effective in solving industry contracting problems, particularly in the areas of colouring pigment powders for producing integrally coloured concrete and mortars as well as tough non slip and abrasion resistant paints and ultra lightweight but strong composite concretes in ready to mix-into-water packaged powder product form. Headed by Robert F Barber, considered jokingly by many industry notables as ‘THE Concrete Guru’ possibly for his wealth of understanding of cement based materials and specialties, along with his ability to invent highly beneficial products, Ability’s dedicated staff have reflected his CEO vision of the benefits of conforming to exacting standards. Together they have developed products that often outperform and outlast many others, to proceed onwards to produce and introduce these innovations – some of which are unmatched in the international building industry supply chain. In response to both Industry needs and address people’s environmental concerns, the development in past years of Ability’s once unique bio-degradable Concrete-Friendly® and water soluble Hydrapac® dissolving product packs that provide easy mixing into pre-mixed concrete of a consistency to easily surround the steel reinforcement in concrete and easily place, compact, finish, cure it, are perhaps examples of this novel approach. Good, old fashioned friendly customer service provided to all persons is part of that vision, along with the provision of individual customised products of which too few opposition building supply companies can boast. Mr Barber believes that Ability sells ‘durability’. Durability, a theme behind all Ability materials and products and the main standard which characterises the product range – all headed by their environmental green ‘five star’ performance. These include: abilox® mineral oxide colours, harmless to human and animal life, Efflorein® Mark 2 waterproofing and efflorescent salt controlling admixture for cement based materials which are not separately contained within and leachable out of the hardened cementitious material and therefore harmless plus the three duro paints™ with Leviathan® Matte as members of the Ability family of high performance paint coatings which are all available at sensible prices. Ability products offer many outstanding benefits. For instance the Leviathan® Matte and duro paint™ family of paints are extremely low in Volatile Organic Compounds (VOCs) i.e. almost nil and are sold with a 20 Year Guarantee* of performance (*conditions apply). Efflorein®Mark 2 which offers a totally unique solution in the market place to finite waterproofing of cement based materials and to overcome the problem of white disfiguring efflorescence in and on concrete. Coupled with famous abilox® colourfast colouring pigments which as UV resistant inorganic, mineral oxide colourants suitable for all cement, bitumen resin and other binder based permanent colouring uses and available immediately without waiting in a variety of sixty (60) standard colours. As our company is constantly refining and reviewing its range of products and services – evolving to match the needs of the constantly changing urban environment to architectural inspired customer needs, it is perhaps surprising that Ability’s main products have remained in demand after 32 years from its commencement. The ‘can do’ Australian attitude reflected in the company name is backed by thirty decades of experience and specialised knowledge which can be used to assist architectural clients abroad as well as in Australasia. We welcome your enquiries and hope to be of definite service to you for your next building project.